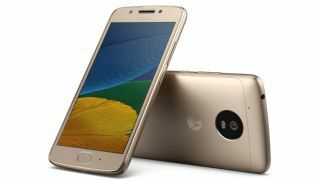 Motorola Moto G5 and G5 Plus launch with metal bodies and low prices | What Hi-Fi? Motorola's new budget smartphones pack some mighty impressive specs into highly affordable packages. Motorola's Moto G range of phones has consistently delivered fantastic value for money - they're decently-specced phones that don't break the bank. And thankfully, Motorola hasn't broken with tradition with its latest handsets. The Moto G5 and G5 Plus are smaller than their predecessors, but they improve on them in almost every other way. For starters, they have metal bodies, while the G4 and G4 Plus had plastic backs. This should make the G5 and G5 Plus feel a lot more expensive than they actually are. The G5's 5in screen, and the G5 Plus's 5.2in are smaller than the G4 and G4 Plus's 5.5in panels, but keep the same 1080p resolution, meaning images should look even sharper. They're powerful, too. The G5 has either 2GB or 3GB of RAM, and the G5 Plus 3GB. Also onboard is a 1.4GHz Qualcomm Snapdragon 430 octa-core chipset for the G5, and a 2GHz Snapdragon 625 octa-core on the G5 Plus. Both of which will be far nippier than the Snapdragon 617s found in the G4 and G4 Plus. From the spec sheet, you might think Motorola had downgraded the cameras. But as ever, the specs don't tell the full story. The G5 Plus's camera 'only' has 12MP, but also features Dual Autofocus Pixels that lock on to your subject quicker and should make for less blurry snaps. The G5 lacks this feature, but its sensor is 13MP, so you can print your pics slightly larger with no loss in quality. Both phones run Android 7.0 Nougat, the latest version of Google's mobile OS. Both should also get Google Assistant, the AI-powered personal assistant, as the company announced it would be made available to most new Android phones via a software update. Motorola hasn't officially announced UK pricing yet. But the G5 will sell for €200 (£170) and the G5 Plus €280 (£240), which sound like bargains. You can register your interest for the G5 here and the G5 Plus here.